Ron Dorn of Elgin, Tracey Rhoads and Steven Powell of Colorado Springs, CO were arrested Friday at a rural Elgin farm. While most drug-related arrests occur elsewhere in Antelope County, Elgin is not immune to visits from law enforcement involving drug crimes. The Nebraska State Patrol issued a press release on Friday with information concerning a search, and subsequent arrests, at a rural Elgin farm. A joint effort of investigators with the Nebraska State Patrol (NSP), the Antelope County Sheriff’s Office, and the Specialized Narcotics Abuse Reduction Effort (SNARE) has led to the seizure of controlled substances and nearly a dozen weapons from a rural residence in Antelope County. In the process of serving a search warrant at a residence near Elgin, investigators discovered multiple controlled substances and eleven firearms. At least one of the firearms had previously been reported stolen. NSP seized more than five ounces of methamphetamine along with marijuana, concentrated THC products, and drug paraphernalia. Investigators arrested Ron Dorn, 56, of Elgin, on charges of delivery of a controlled substance and possession of methamphetamine with intent to deliver. Steven Powell, 47, of Colorado Springs, and Tracey Rhoads, 46, of Colorado Springs, were both arrested for possession of concentrated THC products. Potential weapon-related charges are pending. 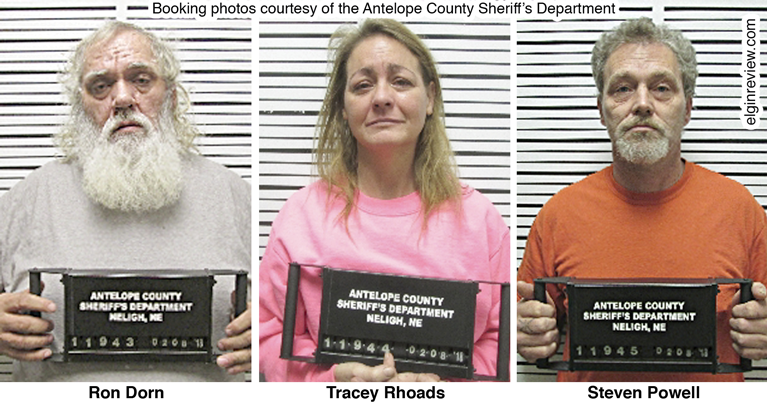 All three suspects were lodged in Antelope County Jail.